The usually composed Portuguese went on and on about the unfair treatment constantly meted out to Chelsea by match officials and insisted that he would not resign unless he was fired, maintaining that he is still the best man to lift the club out of the quagmire they currently find themselves. Even though his “first-to-attack” strategy of literally asking the club management to either back him or sack him seems to have paid off, as the Chelsea board have issued a statement reiterating their full support for him and affirming his position as manager of the club, one cannot help but wonder how patient Roman Abramovich will continue to be should Chelsea fail to win their next two games at home to the equally relegation threatened Aston Villa and away to West Ham United. The Russian Billionaire has in time past been quick to wield his “red card” when Chelsea have looked unlikely to make top four; the unceremonious exit of Felipe Scolari, Andre-Villas Boas and Roberto Di matteo are cases in point. Feelers have it that the only reason why Mourinho is still being retained as the coach of the Blues is because the Chelsea owner has opted to be cautious about making a hasty decision this time around, considering the way he parted ways acrimoniously with the “Special One” during his first spell at the club. Apart from the veiled threat to his position at his beloved Chelsea, the 52- year old also has to contend with the charge of misconduct against him by the English Football Association. If found guilty, he could face a stiff penalty after his comments about referee Robert Madley’s failure to award a penalty to his team during their home game against Southampton which they eventually lost 3-1. 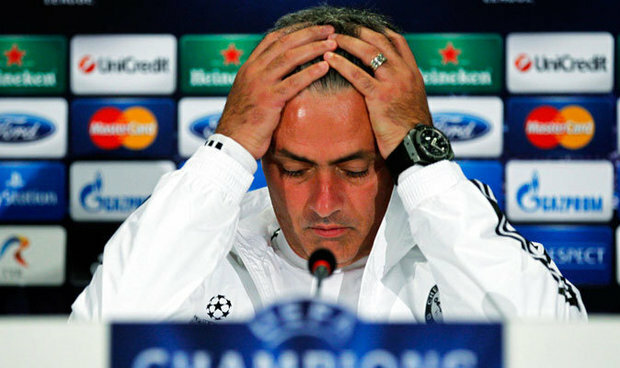 Apart from the much publicised row and subsequent fall out with popular team doctor Eva Caneiro, which not a few people have blamed Mourinho for, there have been rumours about all not being well in the dressing room, especially regarding the dropping skipper John Terry, as well as some senior players for some crucial games; most importantly, their Champions league clash with Porto. But the Chelsea captain has come out to say that the players believe in their coach and his ability to get them out of the doldrums of the bleak situation that they have found themselves. The continued selection of Branislav Ivanovic for matches despite his obvious poor run of form have also raised a few eyebrows. Nevertheless, what is worrisome is that Mourinho doesn’t seem to have identified the problem with his team at the moment; a prerequisite for finding the solution to the problem, for how can one solve a problem that he has not identified? Another school of thought which consists of the former Inter Milan, England and Russia manager Fabio Capello believe that the Portuguese is usually bereft of ideas during his second season at a club, an opinion I find difficult to agree with given the successful spells the Chelsea coach had both in his first and second seasons at Porto and Chelsea. I am of the opinion that if anyone can turn Chelsea’s season around, it certainly would be Jose Mourinho. As a matter of fact, I believe Chelsea can still clinch a champions league spot this season. Apart from his thorough understanding of the Blues having spent a good number of years with them. His impeccable career achievements as a fantastic coach who ranks among the world’s best when it comes to getting results is certainly not in doubt. Very few managers can boast of Mourinho’s pedigree! The stats speak for him! Which is why he is also regarded by many players, coaches and commentators as one of the greatest and most successful managers in the world. The charismatic Portuguese is one of only five coaches to have won the Champions League with two different teams. Not forgetting the fact that he has won league titles in four different countries! Quite a number of people also believe that Mourinho’s “many sins” have come to find him out; citing his flippant tongue and friction with a couple of people (especially Eva Caneiro and Arsenal coach, Arsene Wenger) as reasons for his teams recent misfortune. But for now, I am glad that the controversial Chelsea boss gets to keep his job. Aside his obvious knack for grinding out results and unquestionable knowledge of the game, what would the Premier League be without the shenanigans of the “Special One?” I am also not ready to see his rivalry with Wenger fizzle out just yet; an almost certain prospect if Mourinho were to leave Chelsea now. One thing is sure at the moment; Jose Mourinho needs to put his money where his mouth is and find an immediate solution to his faltering side, or he might just be the third managerial casualty of the Premier League season sooner than later. Wow! Seeing this from you is amazing. Anyone who reads this will think you are a sports writer but anyway it confirms your deep interest in football which is very rear among ladies. As you have said, Mourinho needs to keep the job. No point sacking him. He can reverse the turmoil but what he needs to do is keep his loud mouth shut. Chelsea are in crisis and it’s not the time to brag we are Champions bla bla bla. Rather accept the fact you are in a bad situation. Using the media to express your arrogance only adds more pressure and more pressure can lead to an altercation with media personnel and likewise. When Mourinho claims to call himself the ‘only one’ which is bigger than ‘the special one’ you obviously can tell that the media will hunt you and look to hit back at you when things aren’t going well. It’s up to the Portuguese to change his acts which I believe will influence the outcome from him team. A sports writer complementing my article certainly warms my heart. Thank you! Mourinho has no choice right now but to mind his business and focus on salvaging Chelsea’s season. I wish I could see him and taunt him like a child saying “ntoiii”… many of us have not forgiven and definitely will not forget his verbal assaults on Prof Arsene. The recent trend of events has thus made us all wonder if he (Jose) is actually not the “no. 1 specialist in failure.” Otherwise, how does one explain a tier 1 football manager like him christening a defeat of his team as “fake results”. Nothing seemed to have worked; not even the popular “parking of the bus”… hahahahaha; I laugh out loud in Portuguese! For me, the happenings in the BPL simply shows that no team is resting on her oars and anybody can get thrashed by anybody. There are no sacred cows and no jittery feelings playing against “champions” or any of the “big four” or playing at some funny bridge. You approach any game with this kind of mentality, you risk being seriously humbled by a supposed underdog. We have seen it happen both in BPL and in the CL this season. While the stats may speak well for Jose, personally, I do not rank him so high as technically outstanding. I liken him with that manager who would not do so well in the light of “scarce resources”. Take out “baba olowo Russia’s” rather magnanimous spend and I can bet Jose would be less successful with the blues. Let’s look up the records; how many relatively unknown names has he scouted, groomed and developed into world stars. Not like I am trying to strike a comparison between him and his counterpart at the Emirates but my submission here is that Jose may not be all that ….technically speaking – say like the Ferggies, Guardiolas, Diego Someone’s or even Arsenes of the football world. I will however score him high on his ability to instill confidence in his players and the fact that they consistently draw inspiration from him. Like you have stated, the absence of an urgent turnaround in results of the next few games may just translate to the controversial manager finally meeting his waterloo at the bridge! Nice piece Lolo.. well done. Spoken like a true gunners fan. Hehehe! Ok…you have raised some valid points though. I’ll play the devil’s advocate and root for a Mourinho magic though. Thanks boss!